Oblivion is a redoubtable foe of Icon and Rocket in the Milestone Universe. So for context you should read the Icon character profile first. Base Of Operations: Cooperative Space. Height: 7’2” Weight: 650 lbs. Due to his unusual size and girth, it can be presumed that Kali’kak possesses limited superhuman strength, even when not employing his nano-technology. Through the clever application of Cooperative nano-technology, Kali‘kak has rendered his normal Terminan body mutable. As such, he can convert the entire mass of his form into a highly malleable liquid-like substance at will. When in this altered state, Kali’kak’s body literally flows around solid objects. This renders him impervious to physical assault. He can also shape the entirety of his body or portions thereof into any continuous shape he can imagine. In the past, he has shaped his upper torso into a large anvil like protrusion. He also turned portions of his arms into long bladed appendages. In addition, the nanotech allows him to project waves of radiant energy from his being. It is intense enough to punch a hole through the engine block of a car. From the beginning, the Terminan named Kali’kak was unique amongst his people. In a society that had conquered death, disease, and famine Kali’kak was obsessed with death. Over time, his obsession drove him to commit the most perplexing of crimes amongst the Cooperative – murder. Arnus the first was the mediator at Kali’kak’s trial. Kali’kak was then imprisoned within one of the Cooperative’s few penal colonies. They hoped that with the proper counselling and treatment, he could be reintroduced into society. Perhaps they could also show Kali’kak the futility of his actions. Any being he murdered within the Cooperative was reintegrated or cloned within days and returned to their lives as though nothing had happened. Instead, Kali‘kak grew larger within the prison and even more psychotic. He murdered several of his inmates, doctors and eventually enough of the guards to escape. The Cooperative people were simply ill-equipped to handle his perplexing behaviour. Upon his escape, Kali’kak discovered that Arnus, who had sentenced him, had planned to take a pleasure cruise into deep space. Kali’kak stole aboard the ship and sabotaged the faster-than-light drive. This eventually caused a fatal accident, and the ship disintegrated. Kali’kak returned to his life of murder and carnage. He always stayed a step ahead of the Cooperative authorities until he discovered that Arnus had survived the accident. He was alive and well upon a small blue planet that its inhabitant called the Earth. Rage and frustration raced through Kali’kak’s mind. In an instant he had stolen a ship and set course for the Earth. As he travelled, Kali’kak studied everything the Cooperative had learned about his life on the planet. When he arrived, he activated his nano-assembler technology and donned a costume that resembled Arnus’s own. Then he set about drawing his prey to him. His method was simple, he began to murder each and every citizen of Dakota city that he encountered. To his surprise and great joy, he quickly realized that the inhabitants of the Earth had not conquered death. They desperately wanted to stay alive. In that single second, the burning desire within him was finally satiated. He could kill there and it would be permanent. With that, Kali’kak joyfully went about his gruesome work and attempted to draw Arnus out of hiding. Unfortunately for the citizens of Dakota, Arnus (whom they knew as the costumed hero Icon) had already returned to the Cooperative. Even the interference of Arnus’s former partner, Rocket, and his replacement Buck Wild were unable to halt Kali’kak’s rampage. Kali’kak, who in a moment of pique (caused by Arnus’ absence) renamed himself Oblivion, seemed unstoppable. Until Arnus arrived via transmit (teleportation) in Dakota to personally halt him rampage. The two fought savagely. For a moment Kali’kak seemed to have the upper hand. But a brief distraction from Rocket was enough. 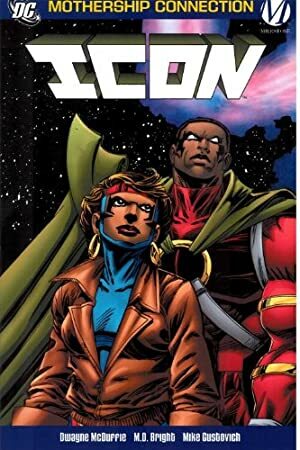 It allowed Icon to use his ionic energy blasts to overload the nano-technology that empowered Kali’kak. With his powers neutralized, Kali’kak was easily apprehended by the Cooperative authorities that had followed Arnus back to earth. Presumably, as of this writing, Kali’kak is imprisoned within a Cooperative penal colony once more. But without his abilities it is unlikely he will have the opportunity to escape again. When employing the nano-technology that grants him his unusual abilities, Kali’kak appears to be a massive bipedal being with jet black skin. He appears to be hairless, with light blue glowing eyes and a wide toothless mouth which glows with an interior fire as well. He has no other discernable features (i.e. no eyes or mouth). When utilizing his abilites, Kali’kak’s body greatly resembles a tar-like substance. It flows from form to form with a seemingly eery life of it’s own. As Oblivion, Kali’kak wore a green cape with a dark bronze ring clasp over his chest where his heart would be if he were human. His hands were covered by dark grey gloves. Like Icon, he wore dark bronze arm and thigh bands around his biceps and thighs. When his powers were eventually neutralized, Kali’kak looked like any Terminan, albeit an usually tall and large one. Kali’kak is a deeply disturbed individual that delights in destruction and is aroused by murder. Even before he managed to kill his first human, he was obsessed with death. He sought every possible means to inflict it upon those that surrounded him. He is completely and irrevocably mad. There can be no reasoning with him. He cannot be bought, bribed, coerced, or convinced to stand down. The only way to stop Kali’kak is with direct, unrelenting force. With this in mind, all of the events of Icon actually occurred in the DC Universe. Thus, Oblivion could be encountered by the player characters through the clever application of the Dimensional Travel power. After the events of the Infinite Crisis and the New 52, the characters of the Milestone Universe are folded directly into the DC Universe. Dakota city is presumed to have been always present. All Powers are contingent on Fluid Form (-1FC). Iron Nerves, Language (Terminan, Cooperative Standard), No Vital Areas, Slowed Aging, Stabilization. CIA towards Death & Homicide, CIH towards Arnus (Icon), Power Loss (Rare, “Overloading” nanotechnology which empowers him reduces BOD to 06 APs and all Powers to 0 APs). Writeup completed on the 26th of December, 2012.